Pride and Prejudice meets Frankenstein as Mary Bennet falls for the enigmatic Victor Frankenstein and befriends his monstrous Creature in this clever fusion of two popular classics. Threatened with destruction unless he fashions a wife for his Creature, Victor Frankenstein travels to England where he meets Mary and Kitty Bennet, the remaining unmarried sisters of the Bennet family from Pride and Prejudice. As Mary and Victor become increasingly attracted to each other, the Creature looks on impatiently, waiting for his bride. But where will Victor find a female body from which to create the monster’s mate? Meanwhile, the awkward Mary hopes that Victor will save her from approaching spinsterhood while wondering what dark secret he is keeping from her. Pride and Prometheus fuses the gothic horror of Mary Shelley with the Regency romance of Jane Austen in an exciting novel that combines two age-old stories in a fresh and startling way. The classic/monster mash-up may seem played out by now, but I promise you that Pride and Prometheus is something quite different, and definitely worth reading. This isn’t a case of an author putting otherworldly creatures — zombies, werewolves, vampires — into an existing story. Sure, those are fun, but once the charm of the gimmick wears off, so does the entertainment value. 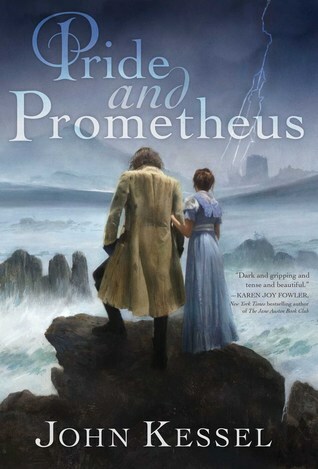 Instead, Pride and Prometheus is a continuation of two stories, Pride and Prejudice and Frankenstein. The author takes two narratives, and imagines what might have happened to these familiar characters if their paths crossed. We begin more than a decade after the events of Pride and Prejudice. Mary Bennet, at age 32, has mellowed and grown since we last saw her. She’s learned more about herself and others. From the scorn and dismissal she experienced as a teen, she’s learned to be more thoughtful, to understand how her lectures and self-righteousness come across to others, and as a result, she’s become a young woman who’s more self-contained. She knows her own mind, but imposes less on others. Meanwhile, Kitty too remains unmarried, and the sisters live at home with their aging parents, growing closer to one another but neither particularly happy about their approaching spinsterhood. Meanwhile, the story of Victor Frankenstein and his Creature picks up soon after the events in Frankenstein. The Creature has sworn vengeance on Victor, threatening to destroy everyone he holds dear, unless he makes a mate for him so he’ll no longer be so alone in the world. In Pride and Prometheus, we follow Victor as he travels to England to try to escape his suffering — and we also follow the Creature, who pursues Victor relentlessly. Mary has developed an interest in science, and when she meets Victor in a social setting, they seem to hit it off. He responds to her interest in his work, and she’s enamored of his intellect, his scientific curiosity and daring, and his treatment of her as if she were both intelligent and interesting. But with the Creature stalking Victor, things soon take a dark turn, and Mary becomes embroiled in the drama of Victor’s attempts to keep his promise to the Creature, while at the same time developing sympathy for the Creature and becoming convinced that he too is a soul worthy caring for. The author’s writing approach in Pride and Prometheus is just so clever and well-done. In alternating chapters, we see the story from Mary, Victor, and the Creature’s points-of-view. As the narrator changes, so too does the writing style. The Mary chapters, told in 3rd person, have an Austen-esque tone, and the Victor/Creature chapters, told in first-person, have the gothic feel of Mary Shelley. Familiarity with both original works — Pride and Prejudice and Frankenstein — is helpful if you truly want to enjoy Pride and Prometheus, although maybe not completely essential. The story would still be entertaining, I suppose, without having read the original works, but I’m not sure the reader would get as much out of it. For me, it’s been many, many years since I read Frankenstein, and I realized soon after starting this book that I needed a refresher. Of course, there are tons of synopses available online, which helped, but reading Pride and Prometheus piqued my interest in going back and reading Frankenstein again. Pride and Prometheus stands on its own as a creative, moving, and engaging story, and it’s also an absolute treat for anyone with a fondness for the original works that inspired it. With terrific writing that manages to capture the flavors of the originals while also telling a story that’s new, startling, and compelling, Pride and Prometheus is a great read that I hope will find an appreciative audience. I know I really enjoyed reading it… and I can’t wait to find other people who’ve read it too, so we can talk about it! This sounds great! I was intrigued but hesitant when I first heard about it but after reading your review, I am definitely moving this onto my TBR list! It’s really worth checking out! Ah wow this sounds so interesting! I’m gonna put this onto my TBR! Great! Can’t wait to hear what you think! This sounds so interesting and fun!